You’ve snagged tickets to the hottest event of gala season and now to plan your outfit. Dress code is Black Tie Optional. Outstanding. Wait. But what does that even mean?! Here are some simple tips to have you the belle of ball in no time. Black Tie, while acceptable, is not required. Black Tie is a dress code that defines and events formality. For men, the traditional tuxedo, with a white show, bow tie, dress socks and shoes, and an optional cummerbund or vest. 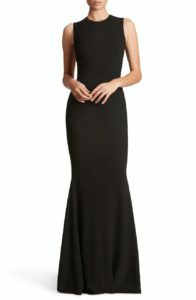 For women, it is the traditional full length gown. Cocktail is appropriate: Cocktail attire is festive and fun, but not formal. 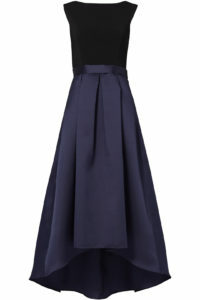 An elegant party dress, typically knee length, and a killer pair of heels. Mind Your Hemline: Be modest. This is not the occasion for the mini dress. If you choose above the knee, go two inches above, max. If you stand with hands at your sides, your dress shouldn’t be shorter than your fingertips. Go Hi-Low: One of the hottest looks this season is the hi-low hemline and it is absolutely appropriate for black tie optional. Drop It Like It’s Hot: Your hemline that is. Don’t forget about tea length dresses. 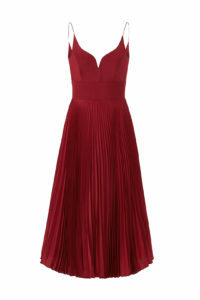 The perfect sweet spot between knee length and floor length gown. Traditionally, tea length hits mid-calf. LBD = BFF: Your LBD (little black dress) is your go to dress. Choose richer fabrics like lace, chiffon and velvet to boost the typical black. Color Your World: Don’t feel like you need to limit yourself to just black: jewel tones, icy pastels and large prints are also acceptable. Don’t Fear the Sequins: Sequins and beads aren’t reserved for black and white tie. Embrace them head to toe. But if you fear you might resemble a walking disco ball, use sparingly. Opt for a sequin top, beaded skirt, sparkly heels or bag. Think Outside the Dress: You can branch out into dressy separates as well. Tulle skirts, taffeta and brocade topped with a beaded shell, a sheer top or an elegant blouse. Wear the Pants: You heard me, pants. Pants can be formal. 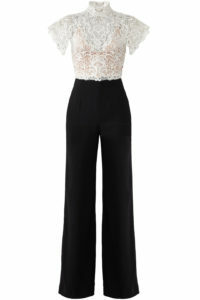 To avoid appearing overly casual, lean towards a pant suit. If separates are your game, mind your fabrics. Gravitate for the richer fabrics. Brocade, silk and velvet will have a dressier vibe. Fancy Feet: Keep your office pumps under your desk. An evening shoe is appropriate. Metallic, jeweled, and straps are always sure-fire winners. Avoid flats and wedges. If feats of great heights in heels aren’t your thing, select for a kitten heel. K.I.S.S. : Keep It Simple Stupid. Don’t be tempted by over edgy trends and over the top designs. Stick with a column dress or A-line. Be wary of trains, fish tails and body hugging styles. Not only will you be physically uncomfortable but you run the risk of injury (think high heel in hemline) or an unfortunate wardrobe malfunction. Ice Ice Baby: Accessorize. Have fun here. Remember, you can be too sparkly. If your dress has a lot of bling, keep the jewelry modest. If you’ve opted for a more reserved dress, bling it up. Add a dramatic necklace or dangling earrings, but never BOTH. Watches are a no-no in formal situations (yes, even a Rolex). And don’t forget your evening bag; a hard-sided metallic bag can be dressed up or down. A beaded or jeweled bag can add some flair to a solid dress. 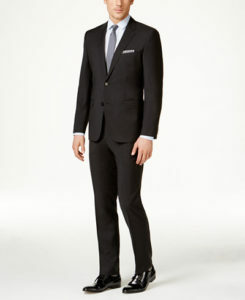 Suit Up: Go with a dark color; navy or charcoal gray is a nice alternative to black. Be a Cut Above: You want your suit to be well-fitted. Dashing and timeless. A toned-down version of a tux. Those elements will be what takes you out of the boardroom and on the town. Simple Finishes: White shirt, a dark tie and black dress shoes (with a presentable shine). Push the Limits: If you want to be a little more daring, go with a black out. Black suit, shirt and tie. Have your tie match your lady’s dress. Bows on Beaus: You do not need to be in a tux to wear a bow tie. Patterns can be a fun away too show a glimpse into your personality. But learn how to tie it – no clip-ons! Don’t miss out on this historic event! For more information about the JLA 35th Anniversary Gala and to purchase tickets, please visit: https://www.jlannapolis.org/jla-35th-anniversary-gala. For more Gala looks, check out our Pinterest page: pinterest.com/jlannapolis.